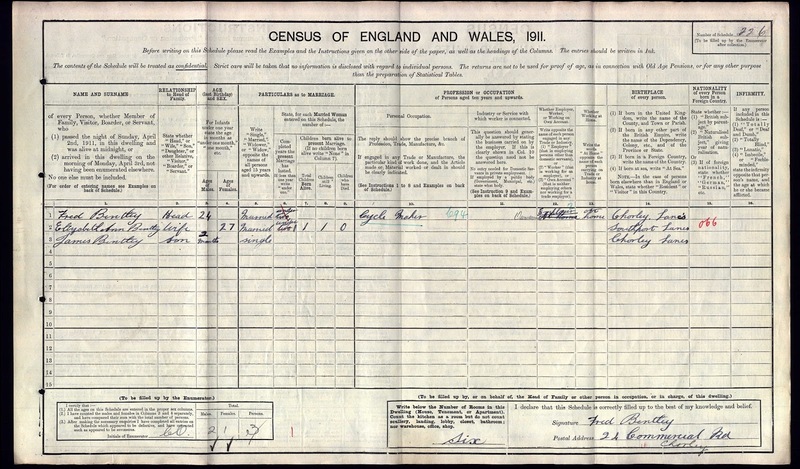 Originally opened in the late 1860s, the Craven Heifer ceased to trade in the early 1900s. 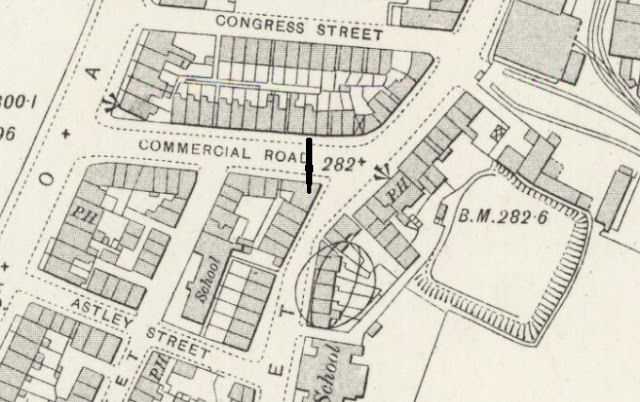 The building itself has long since been demolished but it was the first house on the left hand side as you look up Commercial Road from the junction with Water Street, its gable end pictured below (left). This was a small beer house run from the front room of a residence and references to it can be found on the trade directories and census returns of the period. 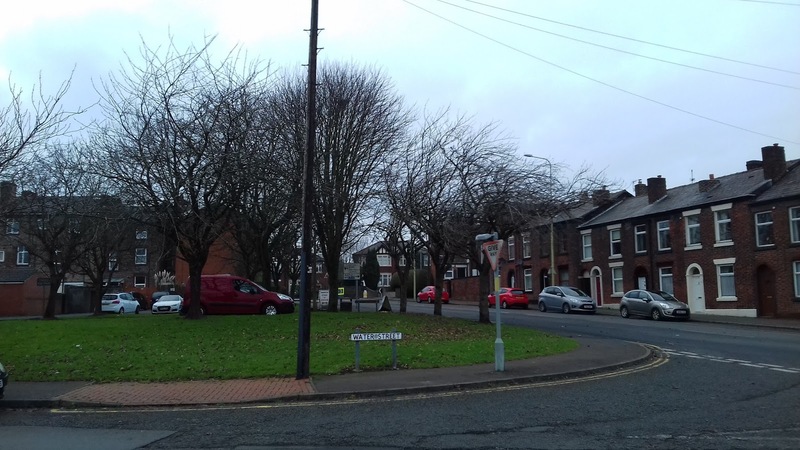 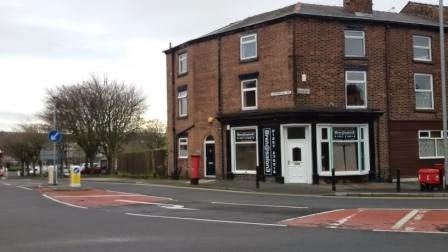 Listed landlords were John Fowler (1871), Thomas B Kay (1872), James Kay (1874), John Higginson (1874), Joseph Jackson (1879-85), John Gaskell (1889), John Brindle (1891), Joseph Skelton (1901), John Robert Kay (1905) and Patrick McGinty (1909). 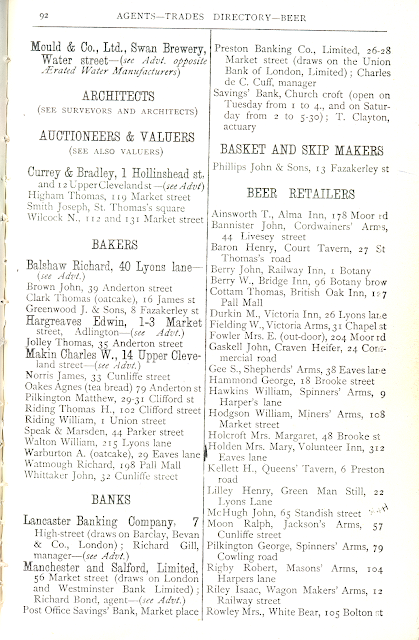 The regular change of landlord is probably a reflection of how difficult trade was during this period, particularly given the close proximity of other more established pubs such as the Towneley Arms, Commercial Inn, Stanley Arms, Parker's Arms, Queen's Tavern and Spinner's Arms. 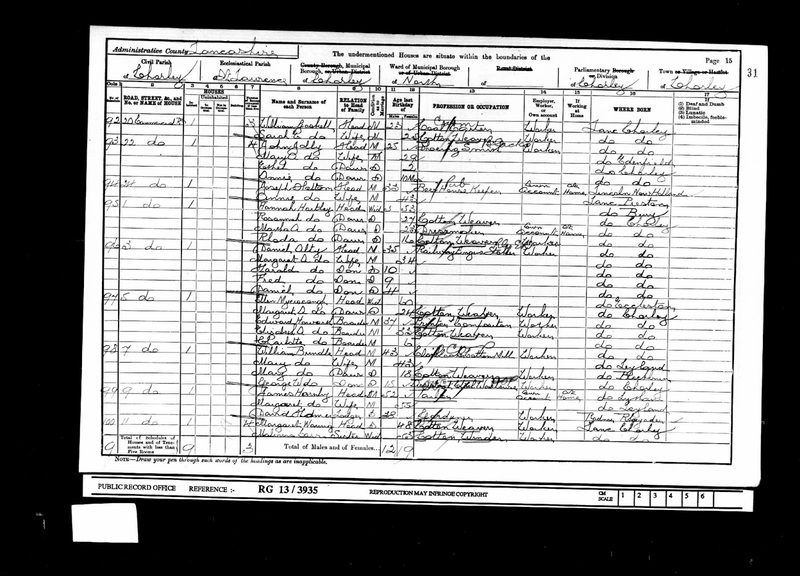 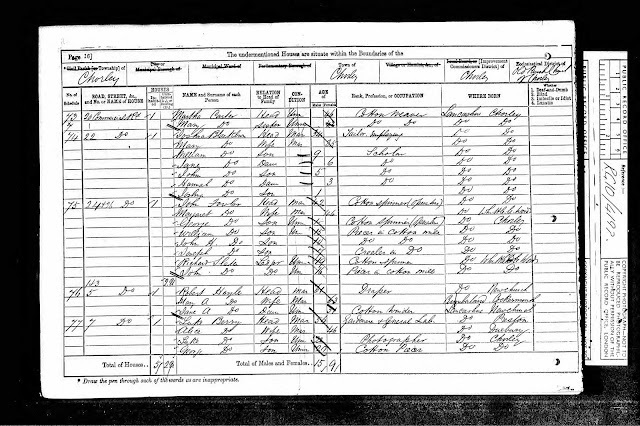 John Fowler listed on the census above was a cotton spinner by trade and Joseph Jackson, who was first listed on the 1879 directory as a beer retailer there is recorded on the 1881 census below with a main occupation of a coal miner, so in both cases it appears the beer trade was a sideline that supplemented their main income. 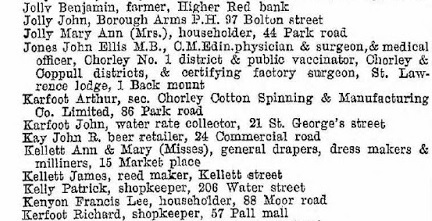 In the 1909 Kelly's Directory of Chorley a Patrick McGinty is shown as living at 24 Commercial Road with the occupation of beer retailer. The Craven Heifer had certainly ceased to trade by 1936 as a "J Sumner Furniture Maker" is listed at 24 Commercial Road on Barratt's Trade Directory but it is possible that the occupants continued to sell beer from the property as some older residents from Commercial Road remember the property from the 1950's and describe it as an old pub. 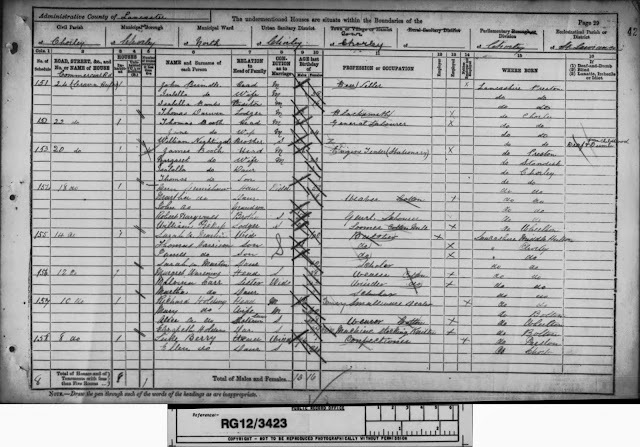 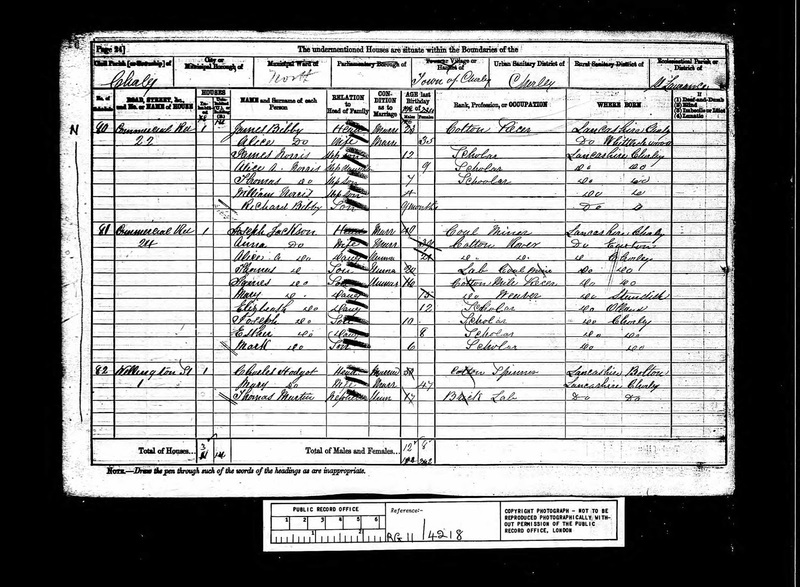 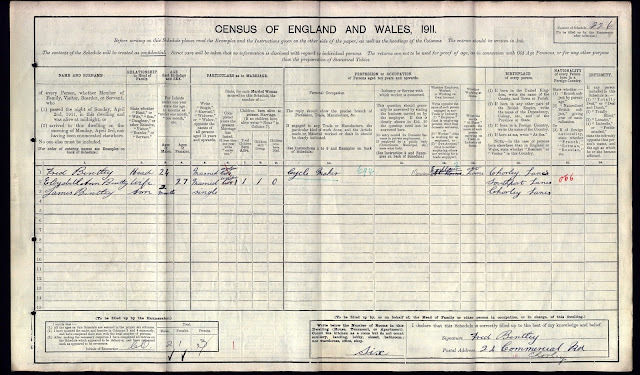 The 1911 census record below again confirms that the occupant was a Fred Bentley whose primary occupation is listed as a cycle maker. 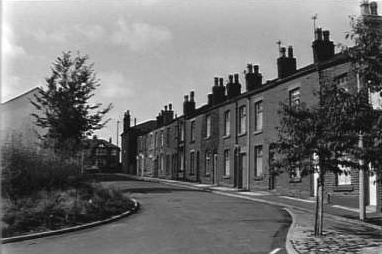 Hello, I lived on Water Street as a child and my Grandparents and Aunty lived at 24 Commercial Road in the 1950's 60's. It has been great to read your research.